Our Community Christmas Photo and our Christmas/Winter Village! 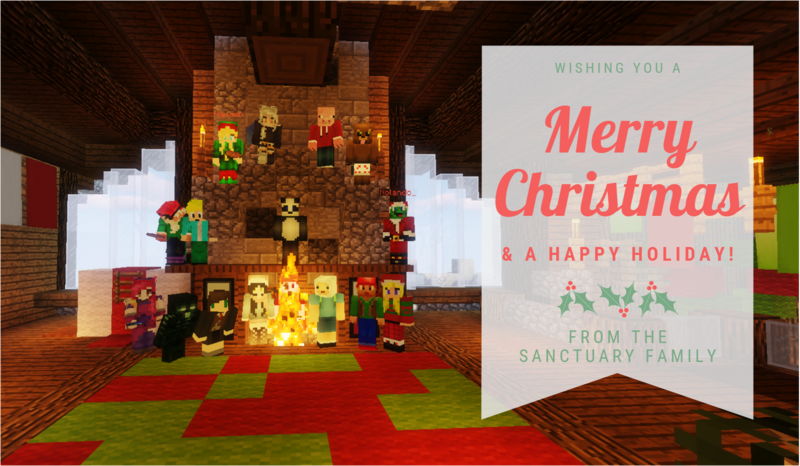 Interested in joining The Sanctuary Community? 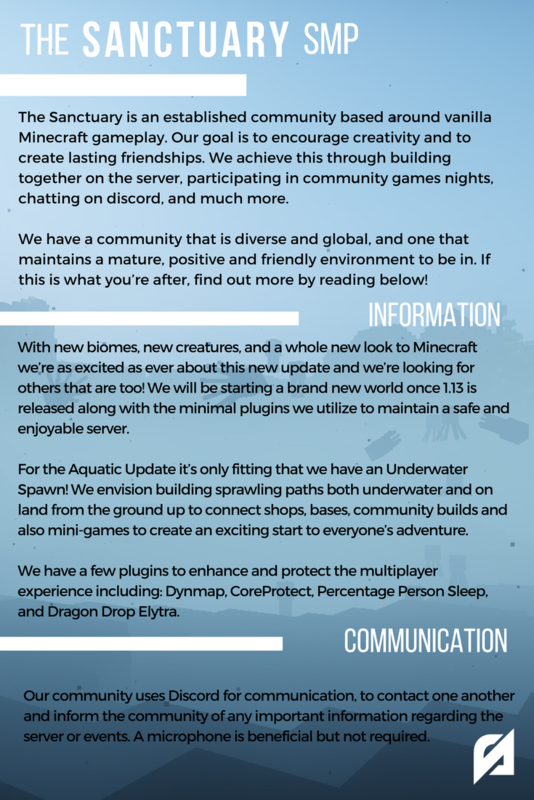 Please fill out the info below to get access to our Gateway Discord Server where you can get to know us and we can get to know you to make sure we are a community that strongly interests you and you’ll be able to enjoy! We are looking for well thought out answers to our questions. We know it can be tedious, but if you want to join our community, show us you can cut the mustard! 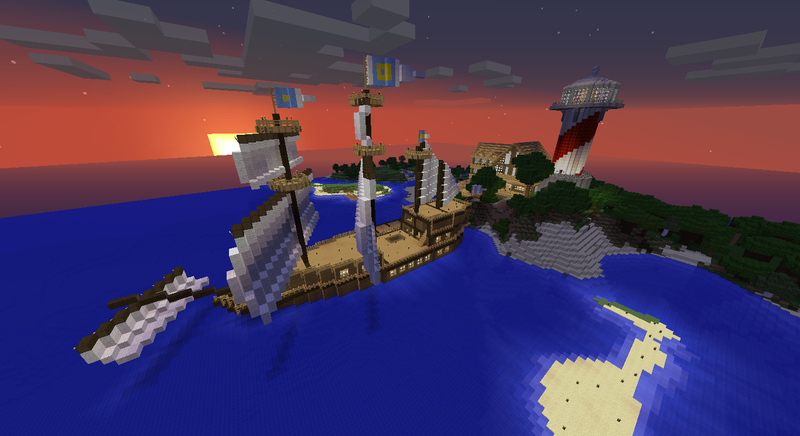 What drew you to The Sanctuary and why are you excited to join a vanilla Minecraft server? Thanks for taking the time to read our community's thread! Hope to see you on server soon! How did you find out about The Sanctuary? : The Minecraft Fourms. Tell us a little about yourself: My name is Dylan, I'm From Arizona. I love playing video games and have been playing them for as long as I can remember. Thank you for your interest in our community Dylan_9000 but unfortunately you don't meet our age requirement. Best of luck finding a community that fits you! How did you find out about The Sanctuary? : Minecraft forums thread. I am currently 19 years of age living in California. I work full time doing quality control and have been getting back into SMP servers. I have multiple hobbies which include: building computers, web development, sports, and working out. I have been into Minecraft and playing it for over 6 years now and have enjoyed all of it. I have played SMP servers in the past but stopped due to a busy life and recently has slowed back down. I am a very outgoing person and enjoy meeting new people. I like to talk with others on Discord voice and possibly work on some big projects together. That;s a little about me and you will get to learn more if I am accepted, thanks! Thanks for your reply Scuzzy_! We are looking forward to talking to you further! Please check your PM's. 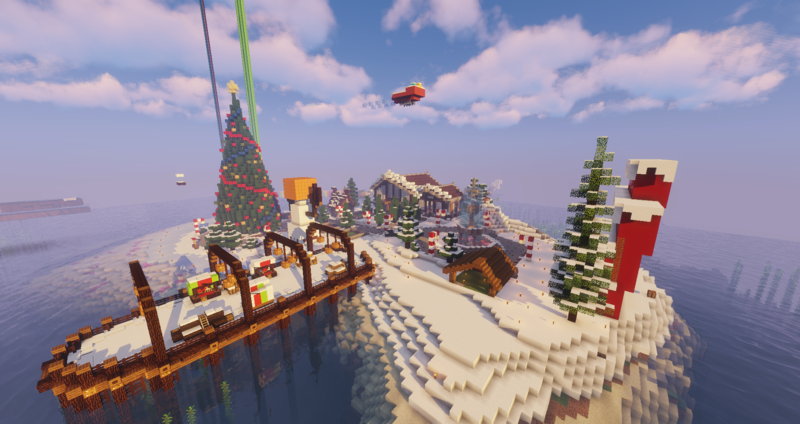 Tell us a little about yourself: Haven't been playing MC much, this last year. Last server I was on sorta petered out as people stopped playing. Excited to start playing again for 1.13. I mostly like building villages or ships, and it seems like this new update will be fun for that. My plan is to build a town of ships over fun, underwater areas. I mostly build alone, but am happy to be semi-near others. Thanks for your reply GraysonS! That ship image looks great! We'd love to chat with you more! Please check your PM's. Thanks for your reply Laggalag! Please check your PM's. Tell us a little about yourself: 21 currently live in Alabama. Live in two different time zones EDT and CDT(yeah i know) Graduate college on may 4 with degree in computer science. currently work as a software developer making android apps. I make a lot of funnies. Also i have a small southern accent most of time. Thanks for your reply zpacee! We'd love to talk with you further! Please check your PM's. How did you find out about The Sanctuary? : Me and my friend wanted to find a new SMP. Are you familiar with Discord? : Yes. Tell us a little about yourself: My name is Andrew, I am pretty nice and a self-endowed builder. I build a lot and I love doing it. Hey Nvk_! Cheers for your application. Please check your PMs! Tell us a little about yourself: My name is Garrett, I like to think I'm a pretty chill guy, I enjoy communities especially when they are smaller and you can connect with other players individually. Heya Scarv. Please check your PMs! Some great applicants already!!! Woohoooo! Keep 'em coming! Tell us a little about yourself: i have been playing minceraft since pre alpha, so a while now. i work as a chef so my hours on time to play might be a bit on and off but will be on as much as possible. i like to be part of an active community while people are on actively. Thank your for your application!! Please check your DM's! Now is a great time to join The Sanctuary! This weekend we have a few exciting events going on and you do not wanna miss 'em! Is it a problem that Im younger than 13? Sorry Mattheww. Given your age and application, I'm going to have to deny your application. I hope you find one that suits you needs! Tell us a little about yourself: i'm 25 have 3 kids and work full time, when not working and playing with the kids i'm on my pc playing games and enjoying myself, i'm currently looking for a new community to settle in with as alot of my previous friends have stopped playing over the years. Thanks for applying, Mr_Rowley! We're excited to talk to you more. Please check your PM's!! Are you familiar with Discord? : Yep, I use it daily. Tell us a little about yourself: I've been playing Minecraft off and on for a long time, 4 years on this account probably close to 7 years in total. I've got a degree in psychology and health promotion but I work casually as an amusement worker. I used to run a twitch channel with around 800 followers and I'm currently starting a new channel thanks to an improved internet connection and computer. In relation to Minecraft, I love all things related to building, surviving and inventing. I mostly enjoy collaborating with others and completing shared goals but the occasional solo mining spree is also a nice way of winding down and relaxing.